Why Examine the Action Agenda for Sustainable Development Report? What sort of action is being advocated, why and by whom? What narratives frame the text? 1. Poverty is equated with economic poverty, and the lack of economic development in ‘Third World’ nations re-legitimizes ‘First-World’ aid-orientated intervention. 2. Hunger is reduced to a simple, technical problem that requires ‘quick-fix’ solutions. 3. Vulnerable countries in Africa and Asia are “responsible” for their own poverty; there is pessimism regarding their ability to develop fully. 4. Poor nations are under-developed because they are overcome by “natural” disasters and environmental problems. In 2014, the United Nations called for "a truly transformative agenda to follow the Millennium Development Goals." This study applies a critical qualitative discourse and textual analysis to examine the first priority of the agenda—to end extreme poverty and hunger—set fourth in The Action Agenda for Sustainable Development Report (SDSN) and assesses the extent to which this ‘transformative agenda’ is likely to be achieved. This study found that the report's goal of ‘ending hunger and poverty’ encouraged implementation strategies that were conceptually narrow, vertically structured and heavily reliant on money-orientated, technological solutions, neglecting the need for social change, participation and the strengthening of local and national institutions. The post-2015 mission as outlined in the report has not transformed the debates of the past, but has instead enabled key Western actors to remain within their comfort zone and reaffirm their particular “normalized” view of development (Maxwell, 1996) by failing to address the structural causes of hunger and poverty, which is essential if ‘development’ is to be truly ‘transformative’ and impactful. The Millennium Development Goals (‘MDGs’) have been a powerfully successful tool in terms of mobilizing stakeholders and informing the public about broadly defined human development (Hulme, 2009; Vandemoortele, 2011). However, with a deadline of 2015, questions arise as to whether the MDGs have achieved their goals, whether their concepts tackle poverty effectively, and what the future holds for the development agenda as a whole. More importantly, current consultation activities raise questions about the extent to which the post-2015 development agenda will be different from what has gone before in terms of the targets, goals and actors that determine the agendas for different sectors in society. 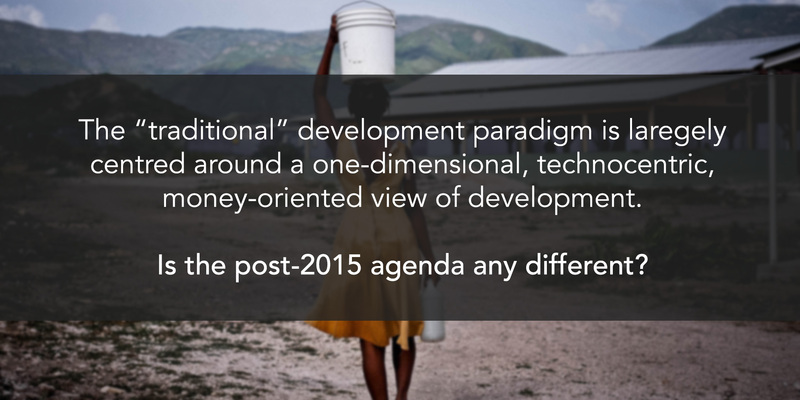 Hence, the aim of this study is to answer the question of whether the post-2015 agenda is “transformative” in the sense that new proposals are “progressive, multi-dimensional and practical” for tackling the problems of development, or whether they are merely the same goals espoused by the “traditional” development paradigm centred around a largely one-dimensional, technocentric, money-minded view of development (Vandemoortele, 2011). The objective of this article is to critically assess the “hunger” and poverty sector challenge found in public reports about development, and explore what it reveals about the processes underway. The Action Agenda for Sustainable Development Report (‘SDSN’ report) was issued on June 6th 2013. It was produced by the Sustainable Development Solutions Network, a United Nations high-level knowledge panel launched by UN General Secretary Ban Ki-Moon with the aim of “mobilizing scientific and technical expertise from academia, civil society, and the private sector” in support of a ‘new’ development agenda (UNSDSN, 2013). The report was chosen because it details a detailed and specific “action agenda” to support global efforts in achieving a “sustainable” post-2015 development agenda, and is explicitly designed to foster a smooth transition from the MDGs to the Sustainable Development Goals created in the aftermath of the Rio +20 summit. It outlines 10 sustainable development priorities covering four dimensions, including sustainable development, ending poverty, environmental sustainability and good governance. The context and structure of this report, combined with its timeliness makes it highly relevant for the aim of this research, which is to determine whether the post-MDG agenda is ‘transformative’ and progressive, or not. The first priority, “end extreme poverty and hunger” (‘SDSN 1’), was chosen because according to the report, it is the first and most important “challenge” of post-2015 sustainable development. The conceptualization and framing of hunger and poverty are also highly controversial, as there are competing visions found in critical development literature (Fukuda-Parr and Orr, 2000). Official documents, such as the focus of this study, have been key targets for both quantitative and qualitative analysis in terms of text and images (Dittmer, 2005). As a key element of the UN’s post-2015, post MDG agenda, the SDSN report play a particular and very significant role in shaping the public’s development imaginaries in both the local and international realm (Mawdsley, 2008). For background information, I first read myriad papers that both critiqued and supported the SDSN and MDG hunger goal. The discourse for this study comes from a detailed textual analysis of SDSN 1, obtained from the Action Agenda for Sustainable Development report available on the UNSDSN website, which suggests priorities for hunger and poverty development strategies for the timeframe of 2015-2030. I chose to apply Mawdsley’s (2008) method of qualitative discourse analysis because it is simple and effective, and falls within the constraints of this report. I chose not to deploy a quantitative methodology or utilise any qualitative data analysis software. Instead, I sequentially and repeatedly read through and coded the document using handwritten and inductive codes to identify contextual and discursive patterns. I also looked for trends in terms of the content, argument, semantics, linguistics, ideologies and so on. Reading through five more times, I interrogated the themes that are evident, and searched for anomalies or mismatches. I focus on two main forms of analysis- 1) a realist, broad-brushed analysis of the arguments in the text (Hajer, 2006), and 2) a critical discourse analysis where I identify the “discursive fragments” and ideological strands evident in the text. The SDSN report aimed to create an integrated and ‘action-orientated agenda’ advocating for post-2015 development within a ‘sustainable’ framework (SDSN, 2013). Therefore SDSN 1 serve three main purposes: 1) to articulate a specific, quantitative and measurable definition of hunger and poverty, 2) to create a “normative” framework of hunger/ poverty and propose ‘technological’, ‘market-orientated’ and donor-centric alleviation strategies (for ‘First World’ politicians to implement in national and institutional policies) and 3) to mobilize donors and international support towards a shared hunger-reduction agenda. SDSN 1 advocates two overarching ‘narratives’ for a transformative post-2015 sustainable development goal for ending poverty and hunger. Hunger is portrayed using a Malthusian perspective whereby its main causes are insufficient “food availability” and affordability due to naturalized “environmental threats.” Hunger is also narrowly defined as undernutrition, omitting alternative indicators of hunger such as the number of underweight persons- of which the latter has indicated that hunger has decreased over time (Vandemoortele, 2011). Vague statistics are used to emphasize the dire consequences of undernutrition amongst vulnerable “children” in particular. The text does not deviate from trends in international policy debates on hunger, which “emphasize technological innovation and private investments as key drivers of productivity increases” (Fukuda-Parr and Orr, 2000; Saith, 2006). Outcome-driven and short-term interventionist strategies to address hunger, such as “targeted nutrition programs” are played up “urgently” in bullet-point style, without any mention of alternative participatory or grass-root strategies. A narrow vision of economic development is explicitly advocated as the solution to conflicts and poverty in vulnerable and poverty-ridden nations. The text mentions the structural issues inherent in poor countries, but stresses that good local governance is necessary for tackling issues of hunger and poverty. A “win-win” situation for both Western and Southern partners is advocated on the condition that resources in poorer nations are exploited “carefully.” The text ends with a warning that poor nations will suffer from the ‘resource curse’ if their growth is not properly ‘managed’, implicating that the West has a responsibility to intervene for the ‘common sake’ of global sustainable development. These two assertions, or “strategic” directions, are interrelated and span across the text – and thus provide an enveloping operational framework that can be used to communicate the agenda of ‘sustainable hunger and poverty reduction’ in ways that resonate with and mobilize support from the intended audience, constituted of diverse stakeholders in various sectors. Underlying the two narratives explicit in the text are four other, more subtle discursive fragments that construct ‘hunger’ and poverty within a one-dimensional, money-metric framework. Poverty’s multidimensional characteristics make a universally accepted definition impossible; hence the target of ‘poverty reduction’ depends on the interpretation of poverty (Vandemoortele, 2011). The text emphasizes poverty not as “voicelessness” or powerlessness, but purely as “economical” poverty, which alludes to the MDG’s misguiding and flawed “$1 a day” target (ibid). The text overstates the increasing intrusion of multilateral agencies and institutes into the sovereignty of poorer countries, under the rhetoric of “helping” with “careful” economic growth. The cautionary tale of the “infamous resource curse” towards the end exaggerates the role of “aid” and assistance, exemplifying the belief that vulnerable nations “need special international support” to solve conflicts. It is clear that the state is being re-legitimized and re-invented to support the market in poorer nations. Local governments are encouraged to restructure their “policy and legal” frameworks and set up new markets for newly “commoditized” resources (“minerals,” hydrocarbons) as stakeholders and “partners” in development (Mawdsley and Rigg, 2002). The focus on hunger as “undernutrition” and as a problem of supply shortage at the national and global scale deviates little from the MDG’s “hunger” target- “to halve the proportion of people suffering from hunger between 1990-2015.” This report is conceptually vague and recommended similar technical strategies as in the MDG report such as increasing “targeted nutrition” programs, but what is notable were the elements left out: attention to the impacts of structural adjustment policies, distributive consequences, economic or political causes of hunger, empowerment and participation (Fukuda-Parr and Orr, 2000). This oversimplification and over-abstraction renders hunger as a simple problem that can be readily mobilized and presented in policy circles. Nonetheless this vertical, short-term approach in tackling problems of hunger and undernutrition would not address the long-term systemic causes of food insecurity (Maxwell, 1996). The text’s ‘supply’ perspective of food security prioritizes production and output with investments, with technological innovation playing a central role (Fukuda-Parr and Orr, 2000). A leitmotiv of “vulnerability” is present in the text, stressing that African and Asian nations cannot and will not development sustainably “on their own.” The phrase “too poor, too remote, too conflict-ridden, too bereft of natural resources…” uses repetition and pre-modifiers to emphasize the degradation in particular named areas such as “Sahel” or “Horn of Africa,” to justify and legitimise a donor-centric involvement in the “much needed” development of these areas. It is assumed that poor nations and sustainability goals are incompatible, yet the reasons for this (“structural conditions”) are purposefully vague. Clearly, there is a message that “it is not the world that has failed the developing countries, it is the developing countries that have failed themselves” (Mawdsley and Rigg, 2003). For instance, paragraphs 2 and 5 identify the primary causes of food insecurity as “population growth” and domestic mismanagement, with an abstract “food market fluctuations” coming second, and with no mention of the impact of the IMF and World Bank’s SAP policies, debt, social instabilities, political legacies of colonialism or a world trade system that is weighted against the South (ibid). The theme of “environmental problems” frequently appears in the text, where issues such as “biodiversity loss” (mentioned twice) and “climate change” (mentioned three times) are linked to the poverty of the ‘Third World’. The merging of “nature” and “Africa/Asian countries” evokes an “othering” mentality, which serves to justify a Eurocentric vision of the ‘Development project’ (Said, 1975). Environmental determinism is evident throughout the discourse, for example poverty is deemed to be caused by the “improper” use of resources, or where environmental threats are implied as the reason for food shortages. The theme of “food security” and poverty are constantly phrased in conjunction with “nature” and “disasters,” without reference to other indicators of food security such as access to food and utilization (Fukuda-Parr and Orr, 2000). The emphasis on the disastrous consequences of natural disasters and ‘acts of God’ in vulnerable regions create an apocalyptic and inevitable vision of poor nations being ‘cursed’ with the inability to climb the development ladder. This set of knowledge also “depoliticizes” the sustainable development agenda and ignores Sen’s ‘entitlements’ thesis (1981), hiding the fact that disasters affect regions disproportionally due to different socio-economic endowments or political factors. This study found that the SDSN 1 priority of ‘ending hunger and poverty’ encouraged implementation strategies that were conceptually narrow, vertically structured and heavily reliant on money-orientated, technological solutions, neglecting the need for social change, participation and the strengthening of local and national institutions. The hunger priority advocates action to achieve short-term improvements through feeding and nutritional supplements rather than by the broad approach of some of the MDG’s predecessors, the 1996 World Food Summit and Millennium Declaration (2000), both of which identified a broad range of actions geared towards expanding access to food encompassing a variety of actors (Maxwell, 1996). The failure of SDSN 1 to address social, political and structural factors contributing to hunger and poverty in different localities, and the lack of opportunity that is inherent in many poor countries casts doubt on the credibility and transformability of its claims of that the poor will be poor due to their “environmentally determined” fate. This study also identifies a paradoxical view inherent in the text, where there is a strengthening in the view that ‘development’ is a cooperative “global” (Western) responsibility, yet that it is not the “world” that has failed the developing countries, it is the developing countries that have failed themselves (Mawdsley and Rigg, 2002). The text stresses the “vulnerability,” environmental crises and shortcomings of African and Asian countries in particular, creating a binary and othering effect that serves to justify and legitimise a top-down, donor-centric involvement in the “much needed” development of these areas. The aim of repeating the assertion that “economic development” is essential to lift poorer nations out of a vicious cycle of poverty is to ensure that the SDSN 1 agenda does not upset the prevailing development paradigm and does not undercut a neoliberal, money-minded view of development (Fukuda-Parr and Orr, 2000). This is unsurprising, given that SDSN’s director is economist Jeffrey Sachs, whom revealed in a press release that this report advises on “managing the economy to protect rather than destroy the environment” (SDSN Network Issues Report, 2013). A narrowly focused economic approach to poverty and hunger alleviation ignores contemporary views that poverty must be seen as “multi-dimensional.” Hence, the inability or unwillingness to transgress this particular framing of development renders this particular ‘development challenge’ non-transformative. Global goals such as SDSN 1 should not become another “one-size-fits all” prescription of national policies. The concept of ‘hunger’ and ‘poverty’ should be expanded to include various definitions rather than a biased selection of indicators that support particular narratives, and advocate an enabling economic environment alongside meaningful processes such as peoples’ participation (Fukuda-Parr et al, 2013). The text’s meta-narratives of human poverty and hunger have not fostered a better agenda for tackling the root causes of instability and inequality; they have merely reinforced the hegemonic narrative that poverty will automatically be lowered due to the trickle-down effect of economic growth (ibid). The post-2015 agenda of SDSN 1 have not transformed the debates of the past, but have instead enabled key Western actors to stay within their comfort zone and reaffirm their particular “normalized” view of development (Maxwell, 1996). This vertical, results-orientated approach towards addressing the problem of hunger and undernutrition may fulfil the post-2015 hunger reduction goal, but would not tackle the structural causes of hunger and poverty, which is essential if ‘development’ were to be truly ‘transformative’ and impactful. Dittmer, J. (2005). NATO, the EU and Central Europe: differing symbolic shapes in newspaper accounts of enlargement. Geopolitics, 10 (1), 76-98. Fukuda-Parr, S., Yamin, A.E. and Greenstein, J. (2013). Synthesis Paper: The Power of Numbers: A Critical Review of MDG Targets for Human Development and Human Rights. FXB Working Paper Series. Fukuda-Parr, S. and Orr, A. (2013). The MDG Hunger Target and the Contested Visions of Food Security. FXB Working Paper Series. Hajer, M. (2006). ‘Doing Discourse Analysis: Coalitions, Practices, Meaning’ in van den Brink, M. and Metze, T. (eds. ), Words Matter in Policy and Planning: Discourse Theory and Method in the Social Sciences. Netherlands Geographical Studies, 344, Utrecht, KNAG/Nethur, 65-74. Hulme, D. (2009). The Millennium Development Goals (MDGs): A Short History of the World’s Biggest Promise. BWPI Working Paper 100, 2009. Mawdsley, E. and Rigg, J. (2003). The World Development Reports II: continuity and change in development orthodoxies. Progress in Development Studies, 3 (4), 271-86. Mawdsley, E. and Rigg, J. (2002). The World Development Reports I: hidden agendas and discursive strategies. Progress in Development Studies, 2 (2), 5-23. Mawdsley, E. (2008). Fu Manchu versus Dr Livingstone in the Dark Continent? Representing China, Africa and the West in British Broadsheet Newspapers. Political Geography, 27 (5), 509-29. Maxwell, S. (1996). Food security: a post-modern perspective, Food Policy, 21 (2), 155-170. Saith, A. (2006). From Universal Values to Millennium Development Goals: Lost in Translation, Development and Change, 37 (6): 1167- 1199. Sen, A. (1981). Poverty and Famines: An Essay on Entitlement and Deprivation. Oxford: Oxford University Press. UN Sustainable Development Solutions Network (2013). An Action Agenda for Sustainable Development: Report for the UN Secretary General. Available at http://unsdsn.org/2013/06/06/action-agenda-sustainable-development-report/ , accessed on 02/02/15. UN Sustainable Development Solutions Network (2013). An Action Agenda for Sustainable Development: Networks Issues Report. Available at http://unsdsn.org/2013/06/06/action-agenda-sustainable-development-report/ , accessed on 02/02/15. UN (2000). Millennium Development Goals, United Nations. Available at http://unsdsn.org/news/2013/06/06/an-action-agenda-for-sustainable-development-networks-issues-report/ , accessed on 02/02/15. Vandemoortele, J. (2011). The MDG Story: Intention Denied, Development and Change, 42 (1): 1-21.